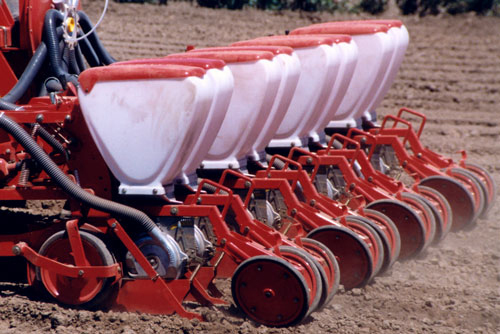 The Gaspardo large seed vacuum planter has proven itself for years. Singulation of corn, beans, and peas is nearly 100%. Depth control is easily achieved with a hand crank that raises and lowers the rear packer wheel. If the standard coulter does not meet your needs, an easily attached double disc opener is also available. Unique, dual singulators set the Gaspardo Orietta Model R apart from other vacuum planters. Most of the excess seed picked-up by the plate is eliminated by the primary singulator. The plate then moves the seed past a second singulator, gaining an even higher degree of singulation. 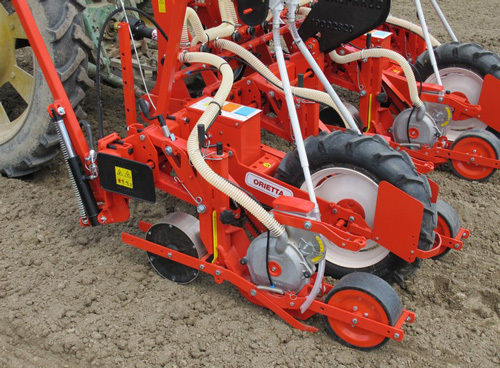 The Orietta Model R is Ideal for planting small vegetable seeds. Click here to see video highlighting Orietta features. Gaspardo spacing charts are available at our Seed Spacing Charts page.